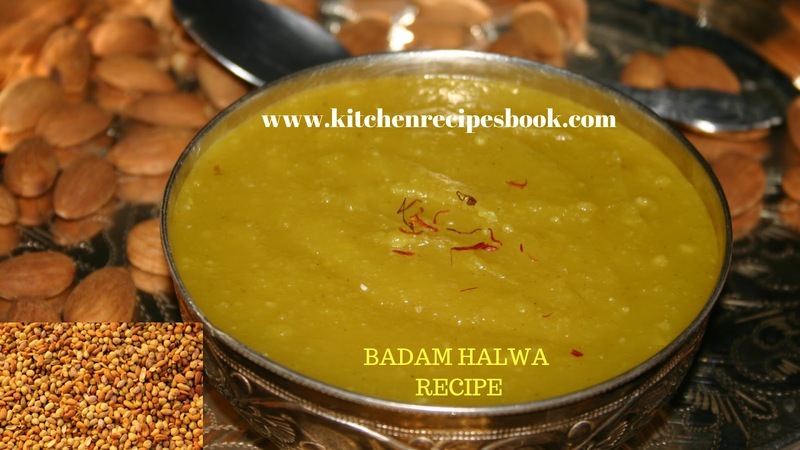 Badam Halwa Recipe: Hi Folks, here we come back with a new recipe in our Kitchen Recipes Book,i.e, Badam Halwa or Almond Halwa recipe. This recipe is prepared in festival vibes, occasionally like Iftar lunch, Holi festival, and Durga pooja. 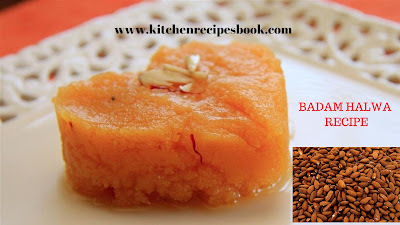 Badam halwa is a well known most popular south Indian sweet and its appearance in famous restaurants only. In this recipe the main ingredient is pure ghee, it gets the favorable taste and good smells aroma. In this recipe I didn't use any food colors, it is optional as your wish. 1/2-3/4 cup of milk or water. 1 pinch of saffron or natural food color (optional). 4-6 tsp of ghee or 2-3 tsp of virgin coconut oil. 1/2 tsp of rose water(optional). First, wash the almonds and soak it a lot of water for 2-3 hours. Peel off the skin and rinse them. If you want the peel of badam comes faster means pour 2 cups of hot water and leave them 5 minutes. after that drain the water and add additional fresh water and soak it for 40 minutes. After peeling then add badam to a mixer jar.Blend badam, sugar, cardamoms, saffron with milk or water to slightly stir the mixer. Kept aside this mixture. First, on the stove and heat a non-stick heavy bottomed pan. Add 3 tsp of ghee, then add badam paste. cook it for halwa thickens, continuously stir gets the best result. while stirring add 1-2 tsp of ghee in regular intervals. Switch off the stove and add a spoon of ghee. Finally, Hot badam halwa is ready to serve. Garnish with chopped almonds,pistas, and kaju. If you want any other recipes please comment in the comment section. The above-mentioned recipe is badam halwa, if you really want to try at home means please follow all the ingredients. Follow all the rules, tips and instructions while making the recipe. If you like our recipe then share to your dearest ones. If you want to stay updated with many more recipes please bookmark my site and stay updated with new recipes. 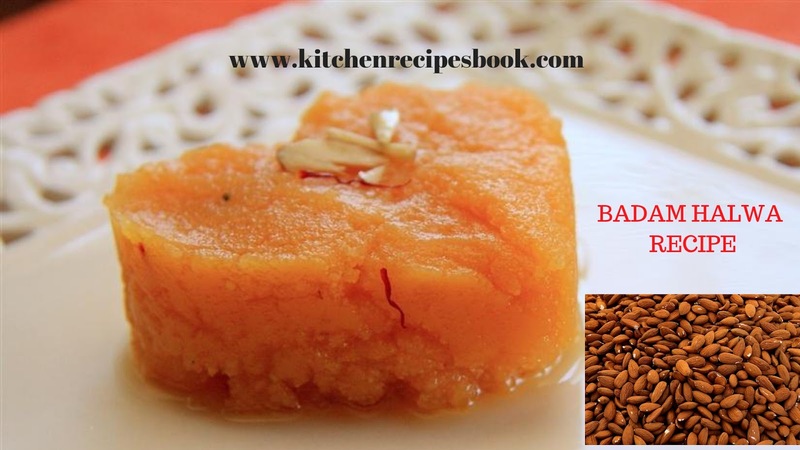 Guys, Above mentioned recipe, is Almond Halwa or Badam Halwa. Try this recipe at home and improve your nutrition levels to increase. In this recipe fat content is high so use the only low amount of ghee. If you have any other recipe simply share with us, Stay updated with new recipe foodies.